BARRELASSIN': SANTA CLAUS: REAL OR AN EXCUSE TO EAT COOKIES? This was the topic of conversation last night while I was attempting Christmas Tree duty. And I must say that it's long overdue; I typically have the tree up and half of the Universe decorated by now. Getting back to the point, My children are fifteen and older and definitely do not believe in a real Santa Claus anymore. In other words, they know I am not actually Santa, but I do his job every year. Santa is one of the few fictional characters that exists and has the whole world working for him. So my Barrelassin' son was venting about whose great idea it was to leave cookies for Santa at night and then get to eat them when the children went to bed. This was definitely someone who was caught with their hand in the cookie jar by an unexpected visitor; the child they assumed was sleeping. I must say, we had a barrel of laughs. They even wondered why nobody ever talked about Santa and Diabetes. I was trying to put ribbon on the tree as my husband was explaining how he felt betrayed by his parents when he found out Santa wasn't real. Not so much because Santa wasn't real, but mostly because he had been lied to for so long. My guess is that he couldn't believe they had pulled one over on him ;). I could not stop laughing. This lead to me explaining my feelings the very moment I found out Santa didn't exist. Or I guess I should say, the moment I confirmed it. I'm sure I believed in Santa one-hundred percent at some point, but as far back as I can recall the topic, I always had my suspicions. I always had some doubt that there was actually a jolly man traveling the entire world in one night delivering gifts to everyone. Don't get me wrong, I wanted to believe so badly. I literally remember hoping so bad that Santa was real, but I was not convinced; the evidence was really stacked against Santa. For instance, why on Earth would Santa hide my presents in my mom's closet, only to return and wrap them, pack them up all over again, and deliver them through the chimney that we didn't even have? That seems like a lot of work, and even I could see what a mismanagement of time that was. And nobody who tried to convince me could ever seem to look me in the eye and answer my Santa questions. I was like a prosecutor I imagine. Like when me and my mom were walking down a sidewalk one night and she tried to get me to watch for Santa's sleigh in the sky. I really think she was just trying to get me to shut up by giving me something to focus on. And I suspected that then, but she had also just explained to me that there was no thirteen o'clock, so I couldn't be sure yet. I was not in school yet, and I can't say what age I was when I was given a solid answer on the matter, but I know it was before the age of nine, because by that time, I wanted a stereo for Christmas, and me and Barrelassin' cousin waited patiently to the end of the gift opening session to for those stereos. We didn't really care about no fake Santa, we wanted to rock n' roll! My confirmation of Santa being a fictional character was probably much different than many others. I recall my very first feeling being a little hopeful. I was like, if Santa isn't real, and the Easter Bunny isn't real (I don't ever remember actually falling for that crap. I played along, but I can't actually remember ever buying that load of eggs) then...maybe the booger man and the Devil/Satan wasn't real either!! Oh this was going to be great! Finally, I could tell a lie or act out without that fear in the back of my mind of going to Hell! I asked my mother if he was, indeed, fictional as well, and she explained to me that one was real and there was no way around it. Are you kidding me?? What kind of world were we living in? A world where all the nice, fun people were made up stories, but the bad guy, the most terrifying guy, was the real one? This was not good. You see, I don't remember being upset at all that Santa didn't exist, besides, now I could tell my mother what I wanted for Christmas with confidence and not have to worry that my list was being left in the hands of a busy stranger in a red suit, that may have other children's best interest in mind over mine. 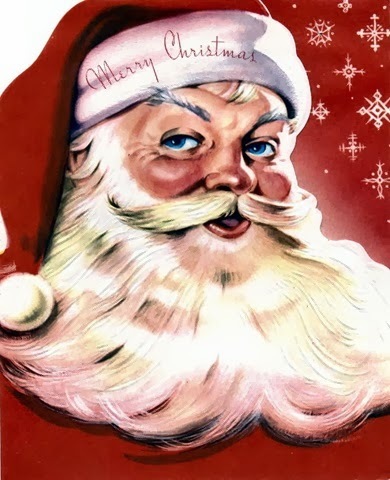 My entire memory about it is being more disturbed that Satan really did exist and the fact that I had had a hunch all along about Santa, but now I could say "I knew it! I told you so! I was right all along! I was right. Do you hear me world? I was right!!" And that was the important thing.